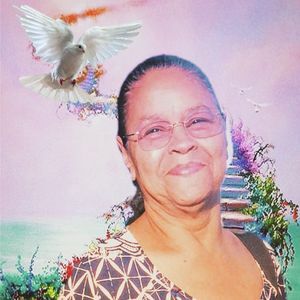 Jerlene was born on October 24, 1942 and passed away on Thursday, March 28, 2019. Jerlene was a resident of Fort Belvoir, Virginia. The beautiful and interactive Eternal Tribute tells Jerlene's life story the way it deserves to be told in words, pictures and video. A mother's love can never be replaced. Dorinda, my prayers are with you and your family. You have been a selfless, supportive friend for years now. I have read the comments and wish I had met your mother. Please take comfort in knowing that she's smiling in heaven and resting with Jesus. Your mother love will never end, she is just resting now. She will be in your hearts forever. I will keep you all in my prayers. Aunt Faye personified the true Christian spirit. Empathy, Compassion, Grace, Humility, Selflessness all come to mind when I think of her. I will always cherish her memory. She confirmed that angels are amongst us. To my cousins .Keep your heads up....for when it's all said and done she will rise to hear the resounding words: "Job well done, my child, Well Done!! I'm saddened to hear about the passing of your mom. May the beautiful memories forever keep her alive. I hope the family finds comfort and strength in the love and unity of one another, friends, and acquaintances during this difficult time. Grace, classy, loving, caring, open-minded, reliable, dependable, and beautiful are a few of the many words that come to mind when my mom and I think of Ms. Jerri. She was my mom's best friend and her family became our second family. We are very appreciative and thankful for the times we spent with her. While she will be deeply missed, her words of wisdom, explementary kind nature, and loving heart will never be forgotten. Very sorry to hear about the loss of your loved one. I am praying for you. I appreciate everything you have did for me. You helped raise me and you help raise my son. No words could every express the love I have for you, and I know you are in a better place. That does not take away the pain or hurt I love and miss you. I met Mrs. White-Whorley at a dinner she hosted. I was taken by her warmth and kindness and more importantly the warmth and love shown by her family. Surely that was learned from her. As you mourn also celebrate. You had a jewel for a mom. You had a mother whose life was dedicated to each of you. What a blessing. I had one opportunity to meet her and I remain eternally grateful for the experience. Mama,for the short time that I have known you,you treated me as your daughter and that made me felt like I was part of you.If tears were stairs mama,I would have climbed to bring you back. Mama, you came and fought a good fight of faith and have returned to your creator where there will be no more sorrow,pain but everlasting life. Rest in Peace mama as you prepare a place for us all in your Father's house.Adieus. My heartfelt condolence to the family.